After 7 hours, it was finally happening. While people had been walking down the carpet clearly dressed for the Academy Awards for a long time, we now had a collection of known quantities around the Carpet ready for action. (Al Roker, Kristen Chenoweth, Robin Roberts, Kelly Rowland, Michael Strahan, etc.) Never saw Ryan Seacrest though – he was much closer to the beginning of the carpet. The first “famous” (non-“reporter”) people were the Ballot Box guys walking their precious cargo with great determination. And then doing it again for a better camera shot. 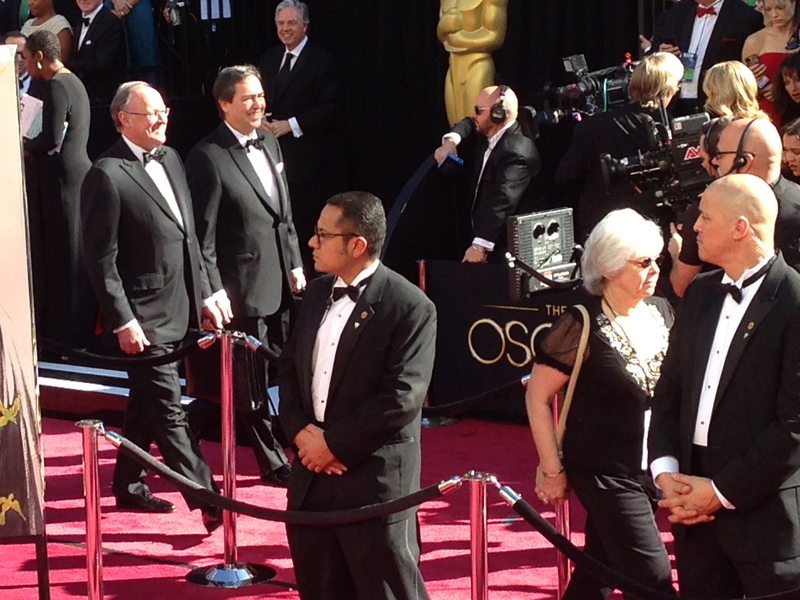 Then we had a series of interviews with nominees…but not the ones we wanted. Still, it was nice to hear from Benh Zeitlin, director of Beasts of the Southern Wild, who looks like he is 20, Michael Dana, composer of Life of Pi, Rich Moore, director of Wreck-It-Ralph, and…okay, I wasn’t that interested either. The banter was basic and we wanted the A-Game. And then superstars of Hollywood were upon us. I am a huge Oscar fan. I love the excitement, the contest, the celebrity. The Academy Awards are my favorite night of TV every year. 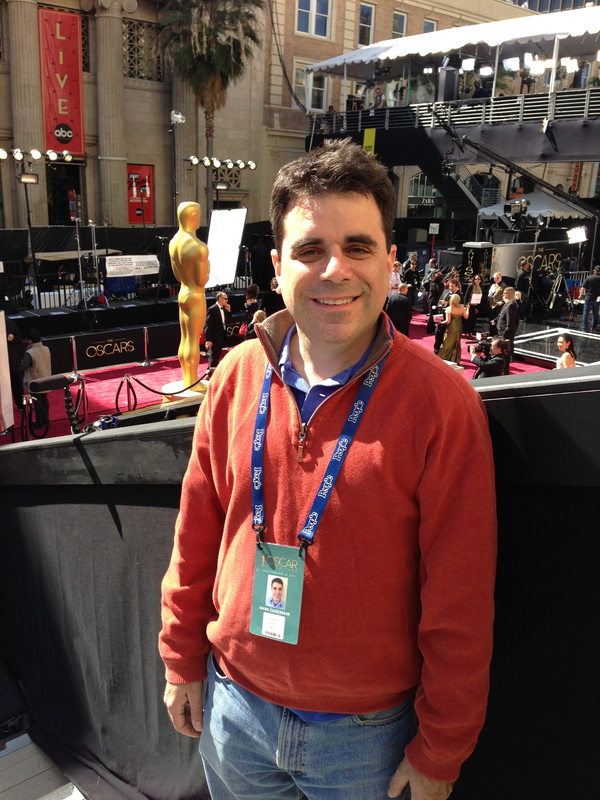 This year, I got a new view of the event as I was thrilled to sit in the bleachers by the Red Carpet and watch the day unfold. I am not a big “celeb-spotter”. When I see someone famous, I am interested, but if they are in a restaurant or the mall, i think they deserve a measure of privacy. I also got my fill of celebs about 20 years ago. I was staying at the famous Beverly Hills Hotel on vacation with my friends Jonathan and Valerie, we stumbled across a small crowd in the lobby waiting for the conclusion of the AFI Lifetime Achievement Award ceremony (I think for Robert DeNiro). About 20 minutes later, the ballroom doors opened a flood of pretty much every celebrity passed by us. Some friendly. Some in a hurry. It was famous people overload and I think served me well for massive star power. But seeing the best of movie stars pass by you in their finest on the Hollywood’s biggest night is a thrill unto itself. To reflect the fun day, I’ll be posting a few separate entires rather than one massive one. How Did I Get the Tickets? How Can You Get Tickets? My student cantor Lizzie Weiss (Thanks, Lizzie!) 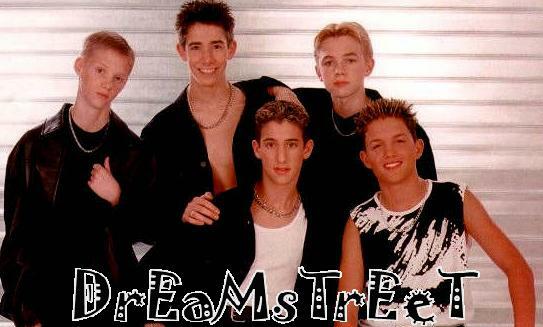 connected my to an auction at Dream Street, a great organization that provides camping programs for kids with chronic and life threatening diseases – NOT the boy band from 1999-2002. They were having a last minute auction for a bunch of tickets. I tossed in a bid and a few days later was told I had won 2 tickets. The Academy of Motion Picture Arts and Sciences apparently gives out these 700 or so bleacher seats through raffles, charities, and various other means. We met people from Hurricane Sandy who also got plane and hotel covered, many many military members, and a fair number of people who have been doing this for years. Not sure how they get their tickets. 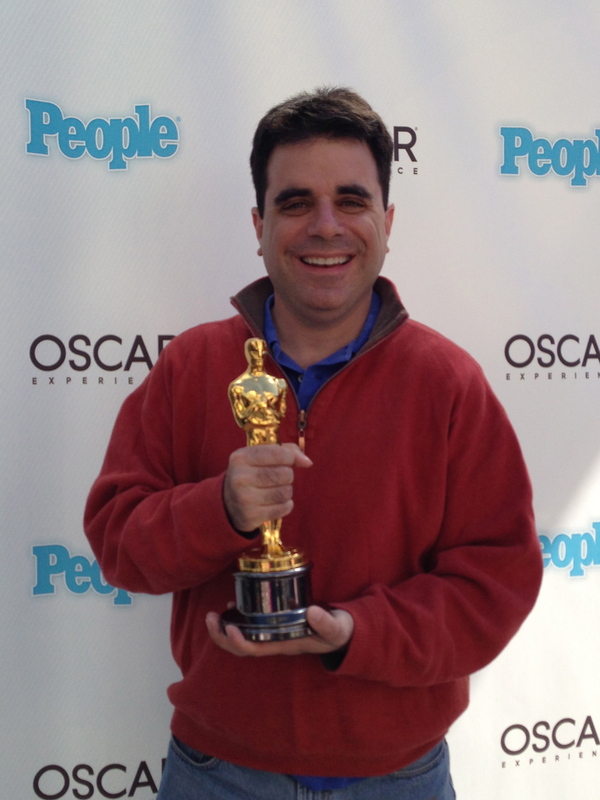 You can learn more at the Oscar Fan Experience. But if you really want them, do some healthy Googling for the variety of places that offer them. Because Dream Street got the tickets only a week before, we had to do the security check in just two days. A detailed bit of paperwork for a background check was followed by an last minute requirement of a photo. Turns out the iPhone can do some impressive editing if needed. I attended the event with my friend David Glickman who remarked that this was more security intensive than when he met the First Lady of the United States. We were told to arrive at 9am, so we got there at 8:30am. We got a lift to the area so we wouldn’t have to deal with parking. A line was formed and at 9am we were led cross the closed part of Highland Avenue onto Hollywood Boulevard. We check in, received fancy looking credentials. We got a gift bag (see later post) and were led to our bleacher seats. 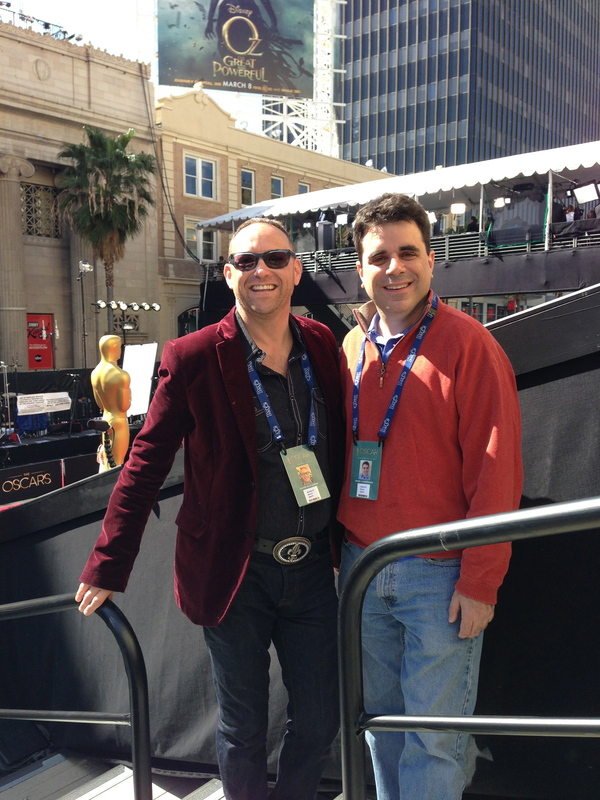 David and I were sitting in the very last set of bleachers closest to the Dolby Theater in the very last row. With reserved seats (supposedly random) we could arrive any time we wanted. It was about 9:20am when we were settled in. The first celebrities don’t really arrive until 3:30pm. But the Academy needs us in and out of the way before they can deal with the rest of the complications of this show. We grabbed some breakfast (later post has all the food details) and took it all in.